Mount St. Helens is an active volcano in Skamania County, Washington, in the Pacific Northwest region of the United States. It is located 128 miles south of the city of Seattle, Washington and 53 miles northeast of Portland, Oregon. 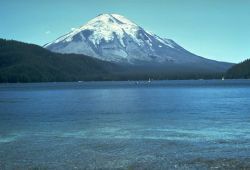 The mountain is part of the Cascade Volcanic Belt of the Cascade Range and the larger Pacific Ring of Fire that includes between 500 and 600 active volcanoes. It takes its English name from the British diplomat Lord St Helens. Helens was a friend of George Vancouver, an explorer who made a survey of the area in the late eighteenth century, after whom Vancouver, British Columbia is named. Mount Saint Helens is known for its volcanic ash explosions and pyroclastic flows and is most famous for its catastrophic eruption on May 18, 1980. This eruption was the deadliest and most economically destructive volcanic event in the history of the United States. Fifty-seven people were killed, and the eruption caused a massive debris avalanche, reducing the elevation of the mountain's summit from 9,600 feet (2,950 m) to 8,000 feet (2,550 m), and replacing it with a mile-wide (1.5 km-wide) horseshoe-shaped crater. It destroyed, or extensively damaged, over 200 homes, 185 miles of highway and 15 miles of railways. The debris avalanche was up to 0.7 cubic miles in volume, making it the largest in recorded history. More than 500 million tons of ash were blown eastward across the United States. By the following month, ash could be found on the other side of the world. A view of St. Helens and the nearby area from space. Mount St. Helens is located 34 miles (55 km) west of Mount Adams in the eastern part of the Cascade Range. These "sister and brother" volcanic mountains are each approximately 50 miles (80 km) from Mount Rainier, the largest of the Cascade volcanoes. Mount Hood, the nearest major volcanic peak in Oregon, is 60 miles (95 km) southeast of Mount St. Helens. 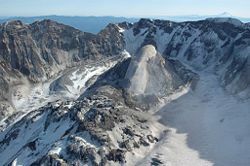 Even before the 1980 eruption, Mount St. Helens was not the highest peak in the Cascade Range; its summit altitude made it only the fifth-highest peak in Washington State. It stood out prominently, however, from surrounding hills due to the symmetry and extensive snow and ice cover of the pre-1980 summit cone, earning it the nickname, "Fuji-san of America" ("Mount Fuji of America"). The peak rose more than 5,000 feet (1,500 m) above its base, where the lower flanks merge with adjacent ridges. The mountain is 6 miles (9.5 km) across at its base, which is at an altitude of 4,400 feet (1,340 m) on the northeastern side and 4,000 feet (1,220 m) elsewhere. At the pre-eruption tree line the width of the cone was 4 miles (6.4 km). Streams beginning on the volcano enter three main river systems: the Toutle River on the north and north-west, the Kalama River on the west, and the Lewis River, on the south and east. The streams are fed by abundant rain and snow. The average annual rainfall is 140 inches (3.6 m), and the snowpack on the mountain's upper slopes can reach 16 feet (4.9 m). The Lewis River is impounded by three dams for hydroelectric power generation. The southern and eastern sides of the volcano drain into an upstream impoundment, the Swift Reservoir, which is directly south of the volcano's peak. Gifford Pinchot National Forest surrounds Mount St. Helens. During the winter of 1980-1981, a glacier, formally named Tulutson Glacier (although the USGS still calls it informally Crater Glacier), began to grow very rapidly (14 m/year thickness) in the shadow of the crater, formed from the annual winter snowfall. By 2004, it covered about 0.36 square mile (0.93 km²) with a western and eastern lobe flowing around the 1980's dome. The glacier looks "dark and dirty" in summer due to the numerous rockfalls on the steep, unstable crater walls and ash from eruptions. The ice is very thick, with an average thickness of 100 meters and a maximum thickness of around 200 meters, nearly as deep as Rainier's Carbon Glacier. None of the ice is older than the year 1980, making the glacier very young geologically. However, the volume of the new glacier is about the same as all the pre-1980 glaciers combined. With the recent volcanic activity starting in 2004, the glacier lobes were pushed aside and higher by the growth of new volcanic domes. The surface of the glacier, once mostly uncrevassed, turned into a chaotic jumble of icefalls heavily criss-crossed with crevasses and seracs due to movement of the crater floor. The appearance of the glacier changes constantly due to uplift of the crater and heavy snowfall. The new domes have almost separated the Tulutson Glacier into an eastern and western lobe. Despite the ongoing volcanic activity, the termini of the glacier have still advanced, with a slight advance on the western lobe and a more considerable advance on the more shaded eastern lobe. The symmetrical and aesthetic shape of the volcano inspired legends. Native American lore contains numerous legends to explain the eruptions of Mount St. Helens and other Cascade volcanoes. The most famous of these is the Bridge of the Gods legend told by the Klickitats. In their tale, the chief of all the gods, Tyhee Saghalie and his two sons, Pahto (also called Klickitat) and Wy'east, traveled down the Columbia River from the Far North in search of a suitable area to settle. The sons fought over a maiden, Loowit, which, as legend tells, resulted in huge destruction of the land. Wy'east, with his head lifted in pride, became the volcano known today as Mount Hood and Pahto, with his head bent toward his fallen love, was turned into Mount Adams. 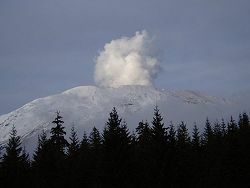 The fair Loowit became Mount Saint Helens, known to the Klickitats as Louwala-Clough which means "smoking or fire mountain" in their language. Sahaptin people called the mountain Loowit. 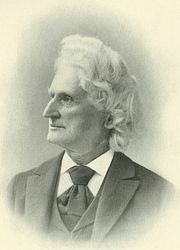 James Dwight Dana was among the first geologists to view the volcano. 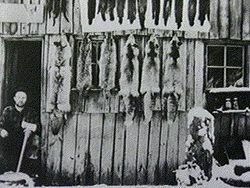 Nineteenth-century photo of a fur trapper working in the Mount St. Helens area. Royal Navy Commander George Vancouver and the officers of HMS Discovery (1789) made the Europeans' first recorded sighting of Mount St. Helens, on May 19, 1792, while surveying the northern Pacific Ocean coast. Vancouver named the mountain for British diplomat Alleyne Fitzherbert, 1st Baron St Helens on October 20, 1792, as it came into view when the Discovery passed into the mouth of the Columbia River. Years later, explorers, traders, and missionaries heard reports of an erupting volcano in the area. Geologists and historians determined much later that the eruption took place in 1800, marking the beginning of the 57-year-long Goat Rocks Eruptive Period. Alarmed by the "dry snow," the Nespelem tribe of northeastern Washington danced and prayed rather than collecting food, and suffered the following winter from starvation. In late 1805 and early 1806, members of the Lewis and Clark Expedition spotted Mount St. Helens from the Columbia River but did not report either an ongoing eruption or recent evidence of one. They did however report the presence of quicksand and clogged channel conditions at the mouth of the Sandy River near Portland, Oregon, suggesting an eruption by Mount Hood sometime in the previous decades. The first authenticated eyewitness report of a volcanic eruption was made in March 1835 by Dr. Meredith Gairdner, while working for the Hudson's Bay Company stationed at Fort Vancouver. He sent an account to the Edinburgh New Philosophical Journal, which published his letter in January 1836. James Dwight Dana of Yale University, while sailing with the United States Exploring Expedition, saw the then-quiescent peak from off the mouth of the Columbia River in 1841. Another member of the expedition later described "cellular basaltic lavas" at the mountain's base. In late fall or early winter of 1842, nearby settlers and missionaries were witness to the so-called "Great Eruption." This small-volume outburst created large ash clouds, with mild explosions following for the next 15 years. The eruptions of this period were likely phreatic eruption (steam explosions). The Reverend Josiah Parrish in Champoeg, Oregon witnessed Mount St. Helens in eruption on November 22, 1842. Ash from this eruption may have reached The Dalles, Oregon, 48 miles southeast of the volcano. British lieutenant Henry J. Warre sketched the eruption in 1845, and two years later Canadian painter Paul Kane created watercolors of the gently smoking mountain. Warre's work showed erupting material from a vent about a third of the way down from the summit on the mountain's west or northwest side (possibly at Goat Rocks), and one of Kane's field sketches shows smoke emanating from about the same location. On April 17, 1857, the Republican, a Steilacoom, Washington newspaper, reported that "Mount St. Helens, or some other mount to the southward, is seen … to be in a state of eruption." The lack of a significant ash layer associated with this event indicates that it was a small eruption. This was the first reported volcanic activity since 1854. The area's first non-Native American inhabitants were fur traders and trappers. Most of these men worked for the fur trading enterprise of the British-owned Hudson's Bay Company. In the early 1890s, Ole' Peterson set up housekeeping at Cougar Flats, on the Upper Lewis River. He lived as hermit, preferring to keep to himself, and enjoying the quiet solitude of nature. Ash from the eruption disrupted life for millions of people. Fifty-seven people died, and the economic cost was US$1 billion. David A. Johnston. on duty for U.S. Geological Survey, hours before he was killed by the eruption. Phreatic eruption at the summit of Mount St. Helens, Washington. 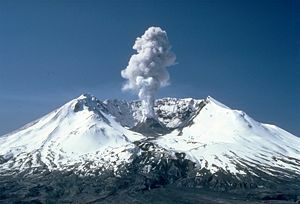 Mount Saint Helens catastrophically erupted on Sunday, May 18, 1980. Prior to the eruption, there were months of activity and build up. On March 20, it had experienced a 4.2 magnitude earthquake. By the end of April, the north side of the mountain began to bulge. Steam venting started on March 27. With little warning, a second earthquake of magnitude 5.1 on May 18 triggered a massive collapse of the north face of the mountain. The scale of the blast is considered minor when compared with past debris avalanches elsewhere on Earth; however, it created the largest landslide in recorded history. The collapse of the northern flank of St. Helens mixed with ice, snow, and water to create volcanic mudflows, known as lahars. The lahars flowed many miles down the Toutle and Cowlitz Rivers, destroying bridges and lumber camps. These mudflows transported a total of 3.9 million cubic yards (3.0 million m³) of material 17 miles (27 km) south into the Columbia River. The newly-exposed hot and pressurized rock in the volcano responded by producing the largest historic volcanic eruption in the 48 contiguous U.S. states. The magma inside of St. Helens burst forth into a large-scale pyroclastic flow that flattened vegetation and buildings over 230 square miles (600 km²). On the Volcanic Explosivity Index scale, the eruption was rated a five, otherwise known as a Plinian eruption. The eruption killed 57 people, nearly 7,000 big game animals including deer, elk, and bear, and an estimated 12 million fish from a hatchery. There was also destruction or extensive damage to 200 homes, 185 miles (300 km) of highway and 15 miles of railways. A film crew, led by Seattle filmmaker Otto Seiber, was dropped by helicopter on St. Helens on May 23 to document the destruction. Their compasses, however, spun in circles and they quickly became lost. A second eruption occurred on May 25, but the crew survived and were rescued two days later by National Guard helicopter pilots. Their film, The Eruption of Mount St. Helens, later became a popular documentary. 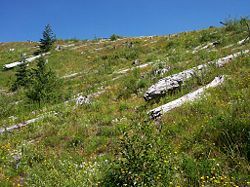 View of the hillside at the Johnston Ridge Observatory, 25 years after the eruption. The eruption of Mount St. Helens changed the lives and landscape of Washington state drastically. Fifty-seven people were killed. More than 230 acres of forest were leveled in minutes. Nearly 150,000 acres of public and private land were destroyed. Many could not fathom the ability to restore the wildlife habitat. Within weeks many dedicated biologists and foresters flocked to the area to assess the damage and assist in recovery. Astonishingly, within weeks signs of life began forcing their way through the layers of destruction. Forests were replanted, vegetation took root and wildlife began to return. Roosevelt elk and Columbia black-tailed deer, along with small animals and birds reestablished their habitats. One of the strongest leaders in revitalization of the area in the decades following the eruption has been the Weyerhaeuser Company (a forest products company), who had lost nearly 68,000 acres of forest, estimated to be enough lumber to build 85,000 three-bedroom homes. They replanted over 45,500 acres with more than 18 million seedlings and have been committed to restoring the area through sustainable forestry. The U.S. Forest Service made similar efforts, planting nearly 10 million trees on 14,000 acres of National Forest land since 1980. Twenty-five years after the devastating eruption, many of the trees planted in its wake are now ready for thinning. Green hills surround the crater and the waters flowing through the valley are again clear blue. In 1982, U.S. President Ronald Reagan and the U.S. Congress established the Mount St. Helens National Volcanic Monument, a 110,000-acre (445-km²) area around the mountain and within the Gifford Pinchot National Forest. Following the 1980 eruption, the area was closed in order to allow for its renewal. In 1987, the National Forest Service reopened the mountain to climbing. It remained open until 2004 when activity caused the closure of the area around the mountain. Most notable was the closure of the Monitor Ridge trail, which previously let up to 100 permitted hikers per day summit the volcano. However, on July 21, 2006, the mountain was again opened to climbers. A steam plume rises from the mountain in December 2004. Appearance of the "Whaleback" in February 2005. Magma reached the surface of the volcano again in October 2004, resulting in the building of a new lava dome on the existing dome's south side. This new dome continued to grow throughout 2005 and into 2006. A number of transient features were observed, such as the "whaleback," which comprised long shafts of solidified magma being exuded by the pressure of magma underneath it. These features are very fragile and break down soon after they are formed. On July 2, 2005, the tip of the whaleback broke off, causing a rockfall that sent ash and dust several hundred meters into the air. Mount St. Helens again showed significant activity on March 8, 2005, when a 36,000-foot (11,000 m) plume of steam and ash emerged—visible from Seattle, 140 miles away. This relatively minor eruption was a release of pressure consistent with ongoing dome building. The release was accompanied by a magnitude 2.5 earthquake. Another feature to grow from the dome is called the "fin" or "slab." Approximately half the size of a football field, the large, cooled volcanic rock was being forced upward as quickly as 6 feet (2 m) per day. In mid-June 2006, the slab was crumbling in frequent rockfalls, although it was still being extruded. The height of the dome was 7,550 feet (2,301 m), still below the height reached in July 2005 when the whaleback collapsed. On October 22, 2006, at 3:13 p.m. PST, there was a magnitude 3.5 earthquake that broke loose a portion of the mountain named Spine 7. There was a collapse and an avalanche of the lava dome. This sent an ash plume 2,000 feet over the western rim of the crater; the ash plume then rapidly dissipated. 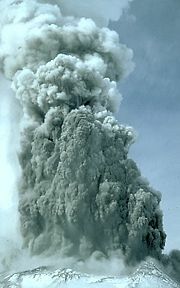 On December 19, 2006, a large white plume of condensing steam was observed leading some to believe that there had been a small eruption. However, the Cascades Volcano Observatory of the USGS does not mention any significant ash plume. On January 16, 2008, steam began seeping from a fracture on top of the lava dome. Associated seismic activity was the most noteworthy since 2004. Scientists suspended activities in the crater and the mountain flanks, but the risk of a major eruption was deemed low. By the end of January, the eruption paused; no more lava was being extruded from the lava dome. On July 10, 2008, it was determined that the eruption had ended, after more than six months of no volcanic activity. ↑ Robert and Barbara Decker. 1993. Road Guide to Mt. St. Helens. Double Decker Press. Retrieved March 25, 2007. ↑ Cascades Volcano Observatory, U.S. Geological Survey. Retrieved March 25, 2007. ↑ Native Americans. U.S. Geological Survey. Retrieved March 25, 2007. ↑ The Volcanoes of Lewis and Clark. U.S. Geological Survey. Retrieved March 25, 2007. ↑ Explorers and Settlers. U.S. Geological Survery. Retrieved March 25, 2007. ↑ September 12, 2003. Summary of Events Leading Up to the May 18, 1980 Eruption of Mount St. Helens. U.S. Forest Service. Retrieved March 25, 2007. ↑ Mount St. Helens – From the 1980 Eruption to 2000, U.S. Geological Survey. Retrieved March 25, 2007. ↑ Eruptions of Mount St. Helens: Past, Present, and Future, USGS Special Interest Publication, 1990. Retrieved March 25, 2007. 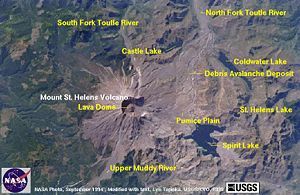 ↑ Mount St. Helens National Volcanic Monument: General Visitor Information. USDA Forest Service Retrieved March 25, 2007. ↑ Climbing Mount St. Helens. USDA Forest Service, Retrieved March 25, 2007. ↑ Mount St. Helens, Washington, "Plume in the Evening," March 8, 2005. USGS/Cascades Volcano Observatory. Retrieved March 25, 2007. Decker, Robert and Barbara. Road Guide to Mt. St. Helens. Double Decker Press, 1993. History of "Mount Saint Helens"
This page was last modified on 25 October 2018, at 20:45.